Have a wonderful new space that is open, bright and most of all we have storage! We moved our kitchen into the former living room, new floors throughout main floor, and updated stair railings. It took longer than than discussed, but the quality was worth the wait. We did a kitchen makeover with Laundry upgrade. Jonathan and the team were very professional, they were true to their word and completed the project on time. They were very clean and the quality of their work was outstanding. Jonathan was reasonable with his estimate and very far. We would refer Jonathan to anyone. One thing that stood out for us is he followed up. We can always reach him when needed. Apartment project: Complete Bathroom renovations (tear down project), installation of laminate flooring in Living dining troom, painting of full Unit, reinforcing kitchen cabinets, and miscellaneous jobs throughout the condo. Skyrock Construction were a pleasure to deal with. They gave very good advice as how we could work within our budget and recommended options that would give us the best return for our dollars. They did their best to maintain the timeline we had discussed, and were successful in completing the overall project in time for us to be ready for our tenants. The quality of work was outstanding, and all materials used were of excellent quality. The material was sourced by Jonathan Daglish of Skyrock. He was detail-oriented and we could not believe how nice the condo looked. What impressed us was that he "under promised and over delivered"
The Skyrock trade team were polite, respectful and complied with the strict guidelines prescribed by the building for contractors. We never had a single complaint about noise levels etc from the Condo management throughout the process. The final clean-up process was thorough and complete. We've done six full guts and one new build - no contractor has been better than Jonathon. We will certainly work with him again. We are very particular - design and its details are extremely important to us. Not only is the quality of their work excellent but Jonathon and his crew members consistently exceeded expectations when it came to solving complicated electrical, structural, and project management challenges. Jonathon is quite personable, does very well under pressure, shows up on time and stays until the job is done. He made excellent suggestions regarding materials and suppliers that saved us money and came back immediately when those little post-project issues came up. We recommend him with complete confidence and look forward to working with him again. Greg & Stephen, I am lost for words, it was an honor to work with you on this project. I am speechless, you not only treated us with respect, you understood when issues came up and you were very patient with us when trying to solve them. Your ability to design and create your vision was something I truly enjoyed while working with you. Your eye for design and taste is next level. The outcome to your project was breathtaking! Absolutely stunning! Anything you or Stephen need I am here. Thank you for all your advice and support. We moved into a 100 year old house that needed a new laundry room, additional lighting and various minor renovations. At the time we were living in a different country so we needed someone who was reliable and of quality. Jonathan lived up to all of his commitments, got us in on time and on budget, provided really insightful, practical and creative suggestions. He also stood behind his work and that of the trades that he brought in. He made the move hassle free and would recommend him. Jonathan is the "easy button" of home renovations. Thank you for your wonderful review, we were under pressure, that's for sure! You were moving from the states back to Toronto, and I didn't want to let you and your family down, you put a lot of trust in us to complete the general renovations needed. We did it though! I want to thank you for always being straightforward and easy to work with. I hope your enjoying your new house. Thank you again for your kind words and you continuing support. I truly appreciate it. After meeting with several contractors we decided to work with Jonathan on this project. We liked the way Jonathan presented himself and felt confident we were working with someone with integrity who would value the relationship and treat us fairly. I’m happy to say that we were not disappointed. From the moment we started discussing the project right to the end, Jonathan was responsive and we could tell how much he cared about his clients and doing the job well. He stayed on top of the project, dealing well with the natural challenges that happen in a renovation (especially on a 100 year old house with countless bad jobs hiding beneath the surface). 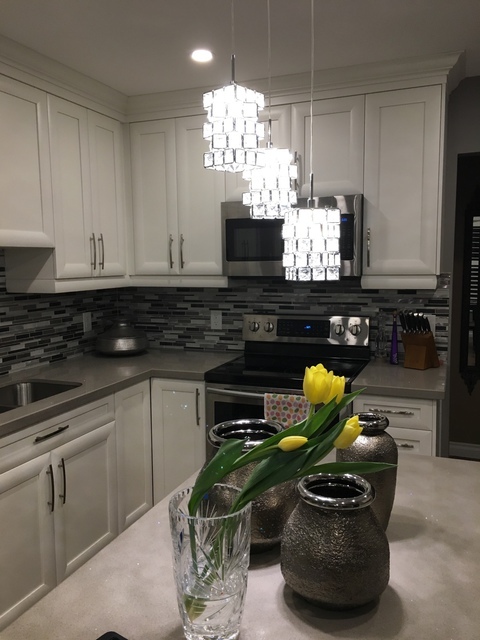 Our job consisted of a full kitchen gut job whereby we relocated appliances (stove, range hood, fridge), installed new custom cabinetry, new flooring, new gas line and a new window, and built in a counter-height peninsula that serves as an eating area with additional storage. We also took down part of the wall between living room and kitchen to provide a more open flow and installed new hardwood in living/dining room. Not only was the work of high quality, but Jonathan also helped us navigate the design challenges inherent in a renovation. He did this by really asking us the right probing questions in a way that helped ensure it was to our taste but also was high-design quality. Matt, thank you so much for these kind words, it was my pleasure working with you and Rose, you are the kindest, most genuine people. We did face many challenges within the construction of your kitchen, we worked through them and the outcome was stunning! Thanks again for taking the time to write this review and your continuing support. Words can not express how grateful I am. Anything you ever need please do not hesitate to reach out. Jonathan was very professional and demonstrated his capabilities for high quality workmanship in carpentry. I would not hesitate to contact him again in the future. Thank you Enzo for those kind words, it was a pleasure working with you, the vanity installation was a little tricky, however we got it done.